When I was very young, my parents gave me a worry stone that was simply a piece of onyx with an indention carved into it. The idea was that I was to rub my thumb in the indention until my worries or anxieties passed. What I didn't know then was that this was not the ideal stone to safely dispense with my negative energies. If you often find yourself in worry mode, you can magickally ground it out safely! Hematite and Apache or Grandmother's Tears are two magickal stones that do not get contaminated by junky energies, so they make perfect worry stones. Carry one of these stones around in your pocket (or find one made into a necklace). Each time you feel worried, hold the stone in your dominant hand (the one your point with) and flow that worry into the stone. The Apache Tear will flow that energy directly into the half worlds, where it can no longer return to you. 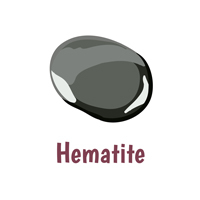 The hematite stone will store an enormous amount of worry energy before it needs to be cleansed. You can easily buy two stones (two of the same kind or one of each). Carry one around for a moon cycle and use it. Then bury it in the Earth to be cleansed for a moon cycle and switch to the other stone. Now a worry stone won't guarantee that just because you flow a particular worry (say about money) into the stone, that you won't have that same worry the next time that topic comes up (say you have to pay an unexpected bill). But here is where the magick comes in. We humans, like Pavlov's dogs, are subject to behavioral training. When we are rewarded with a feeling of relief each time we flow worry into our worry stone, especially after repeated instances of this feeling, then we will flow that emotion into the stone more often. The more often we feel relief, the more our minds realize that we don't have to worry. Not only do we experience a sense of relief, but our minds realize that the world keeps turning even when we stop worrying. And then, presto, when we stop worrying about money and feel more harmonious about the topic more of the time, the Universe sends us more than enough money to cover the bills. Happy feelings in the money department tell the Universe, "Hey, we feel good about money so we can emotionally accept more money now." And the Universe is happy to respond. Want to learn more about using Apache Tears and other simple magick you can do using materials you can find around your house? Then our Kindle book - Learn How to Do Witchcraft Rituals and Spells with Household Ingredients is the book for you!